This recipe surprised me in the best way a recipe can – by being unexpectedly delicious. I’ve written glowingly of Yotam Ottolenghi’s food in the past and his cookbook Plenty remains one of my favorites. As Ottolenghi explains in the introduction to the book, many of the recipes come The New Vegetarian, a column he started writing for The Guardian in 2006. You can check out the original recipe here. As usual, I’ll describe the ingredients I used and the method I followed, both of which vary slightly from the recipe. One caution: Ottolenghi cooks with a lot of oil. He is, after all, a chef and makes his living preparing intensely delicious food. I try to cut down on the amount of oil he recommends, though I always end up using at least twice as much as I normally would. You’ll need . . . In a small bowl, whisk together chile and soy sauces, 2 tablespoons of sesame oil, vinegar, and maple syrup. Cut tofu into small-ish strips or cubes. Pour marinade over tofu in a medium bowl and set aside. Trim bases off Brussels sprouts and cut into three slices from top to bottom. Heat 3 tablespoons of oil in a large pan. 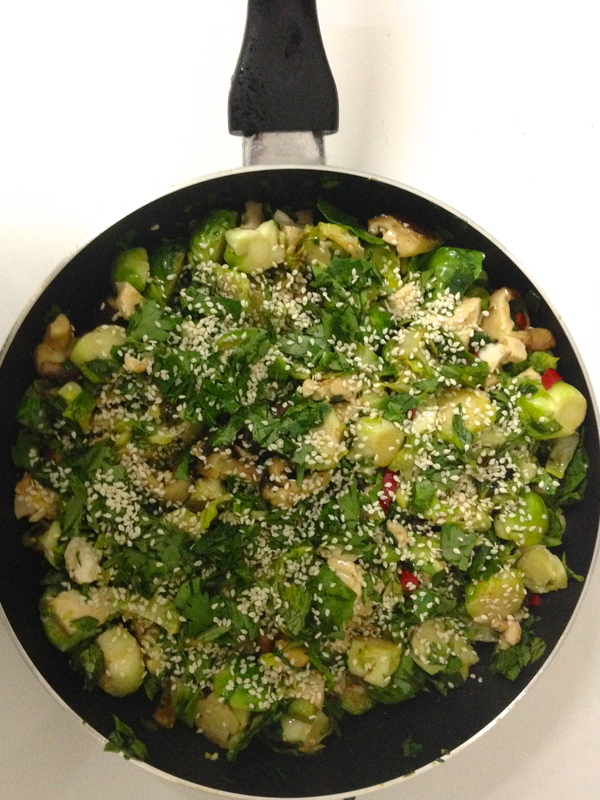 Cook half the sprouts on medium-high heat for about 2 minutes. Don’t stir much. 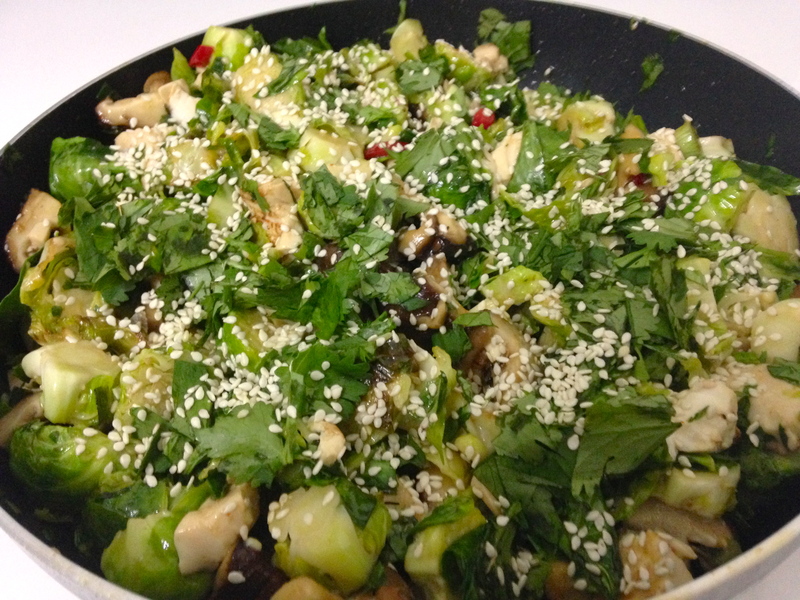 The sprouts should almost burn in a few places and cook through, but remain crunchy. Remove sprouts to a bowl. Repeat with more oil and the remaining sprouts. Remove to a bowl. Add 2 tablespoons of oil to the pan. Heat up and sauté green onions, chile, and mushrooms for 2 minutes. Transfer to sprouts bowl. Leave the pan on high heat. Use tongs to lift half the tofu pieces from the marinade and gently lay them in the pan in one layer. Reduce heat to medium and cook for 2 minutes on each side. Transfer to sprouts bowl and repeat with the rest of the tofu. Remove pan from heat and return all cooked ingredients to it. Add the remaining tofu marinade and half the cilantro leaves. Toss and allow to cool slightly in pan. Stir in remaining sesame oil. Serve warm, but not hot, garnished with sesame seeds and remaining cilantro. Serve over hot brown rice.